4th of July Cupcakes, or patriotic cupcakes, are easy to make and you can use some fun decorating ideas. Red white and blue are the frosting and decoration colors, stars, stripes and flags are the accessories you can use to make a fabulous cupcake display for your 4th of July barbeque. Grill up some hamburgers and hot dogs, serve some salads, and right before you go to see your local fireworks display, serve some red, white and blue 4th of July cupcakes. Your patriotic cupcakes are going to be a big hit at your Independence Day celebration with your friends and family. You don't have to tell them how easy it was for you to make them, and all you had to do was use some edible cupcake decorations. There are also some beautiful cupcake liners in patriotic colors and designed with stars and stripes in red, white and blue. You can also get monochromatic red, white or blue ones. Which ever you prefer, they will help set that "Happy Birthday America" spirit on this, our most patriotic holiday of the year, the 4th of July. We made these cute patriotic 4th of July cupcakes with sugar decorations we bought at our local cake decorating store. We got some flag and star sugar decorations. Here is what the sugar decorations looked like when we opened the package. All we had to do was put them on our cupcakes. Cupcakes are easy to decorate with these store bought decorations. They look great too, don't they. 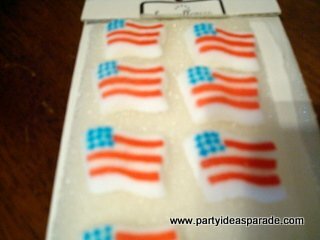 You can get patriotic cupcake decorations at your local store, or you can check The Party Works. It's an online cake decoration shop and they have everything you need to make a fabulous cake...or cupcakes. Here are some pictures of a few pf the patriotic red, white and blue plates, napkins and other party supplies you can use this 4th of July. Along with cake decorating tools and accessories you can also find all the party supplies you will need to decorate for your Independence Day celebration.